Does this book have absolutely everything that every single cook should know? Perhaps not, but this little book is full of useful information. It would be a great book for someone just moving out on their own, for a stocking stuffer, or a tucked into a wedding or shower gift. When I say "little book" I mean that Stuff Every Cook Should Know by Joy Manning really is a small book. Yet it has 130 pages of information. Everything from caring for a cutting board to what to cook for a date. 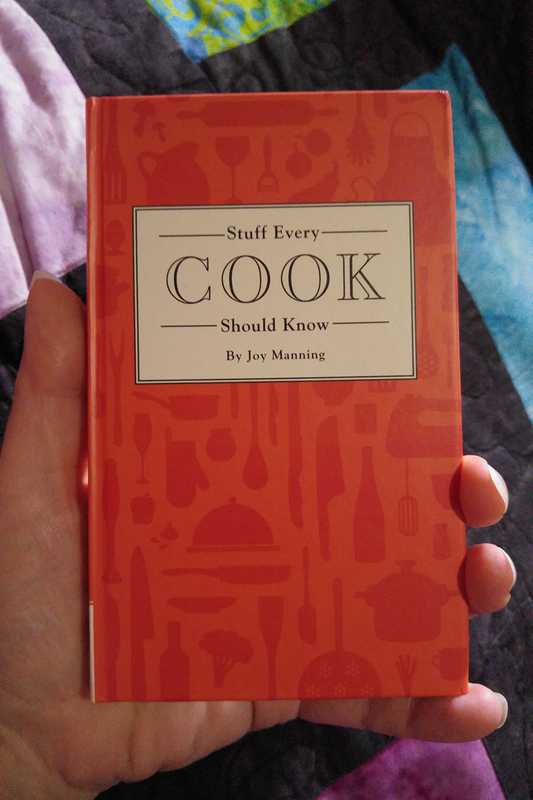 It covers basics, like how to mince, julienne, and dice. It has information on how to salvage some cooking disasters. It talks about how to test different foods for doneness, as well as temperatures for meats. The book doesn't have an index, so looking up something in particular means you'll have to browse the book or go to the front where the table of contents lists all the subject titles. It's not as chaotic as it seems, since the book is organized in groups. First tools, then ingredients, then "three meals a day," then entertaining. While this isn't a cookbook - there are no recipes - it's definitely the sort of book you'd tuck onto your cookbook shelf. The one thing I found odd about this book was a design decision. The pages are unusually thick. That's not a pro or a con, just an observation.